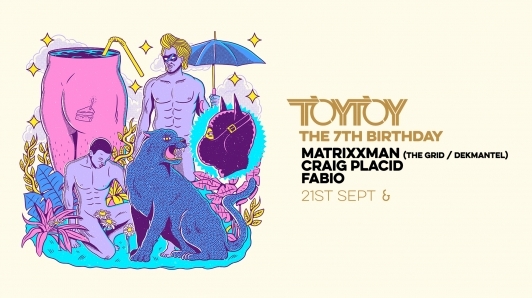 Over the past 7 years TOYTOY has established itself as one of the most consistent club nights in South Africa. Striving to deliver an unwaveringly high standard of underground electronic music, not bound by genre tags but rather encompassing a feeling that can only be associated with these nights. Building an inimitable team of Residents along the way, TOYTOY has become synonymous with rhythm, euphoria and escapism. In celebration of this major feat, we are honoured to host Matrixxman (USA) as the headlining guest artist for our 7th Birthday event on 21st September. Matrixxman's affinity for the raw fidelity of analog drum machines creates a pleasurable symphony in combination with the cold, industrial futuristic structure of his compositions. The combination of these facets will set us off on a challenging and enticing dystopian collision course. Prepare to be drawn into the frenetic and unrelenting darkness of his unadulterated sonic landscape. Support duties for the night rest comfortably in the capable hands of Residents Craig Placid and Fabio who will ensure the revelry strikes a balance to satisfy the palate of everyone on the dancefloor.